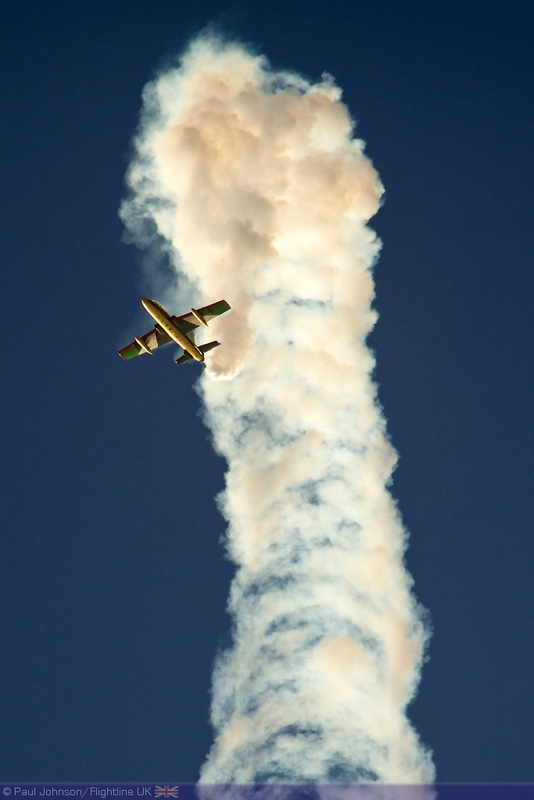 The Royal International Air Tattoo will be welcoming one of the newest national display teams to its flying display this summer, Al Fursan. 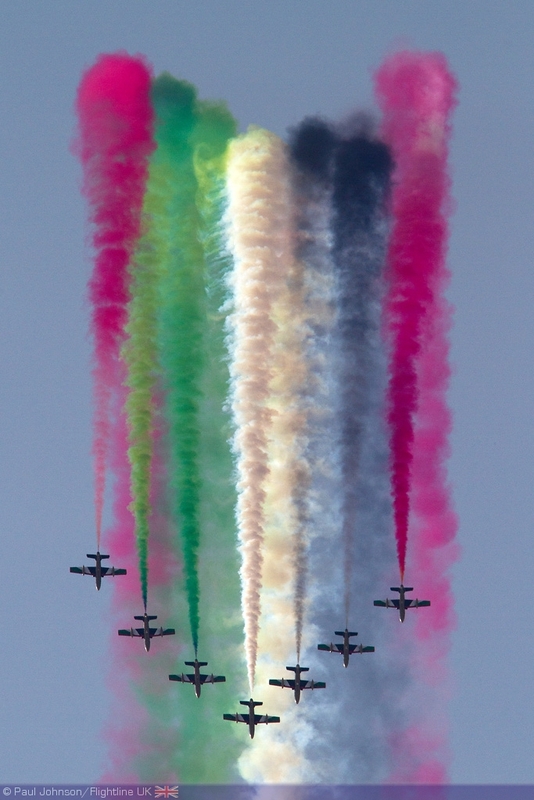 The team are the national aerobatic team of the United Arab Emirates and made their flying display debut at the Dubai Airshow in November 2011. 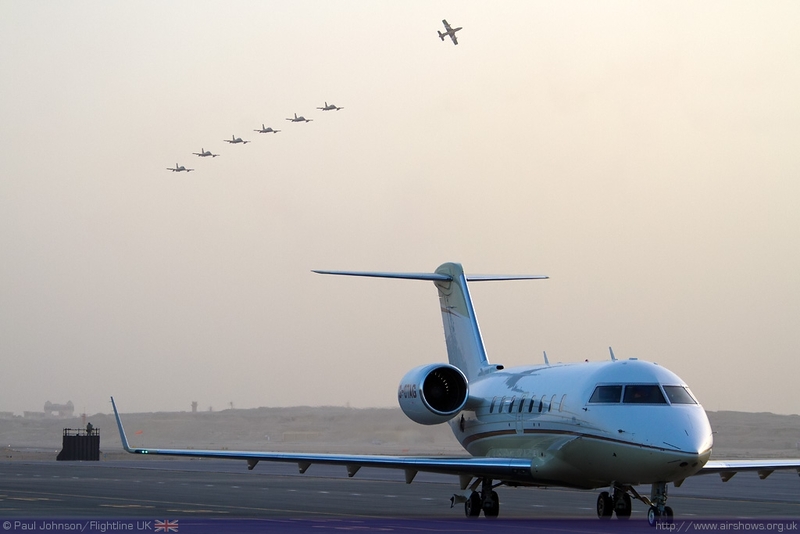 January saw the team make its first international display at the Bahrain International Airshow where Paul Johnson/Flightline UK saw the team for the first time. 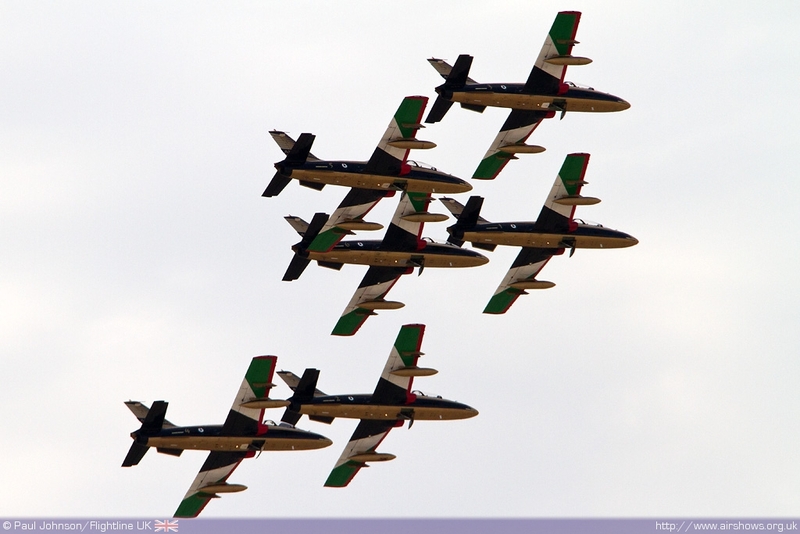 Airshows and Display flying have seen huge development in the Middle East in recent years. 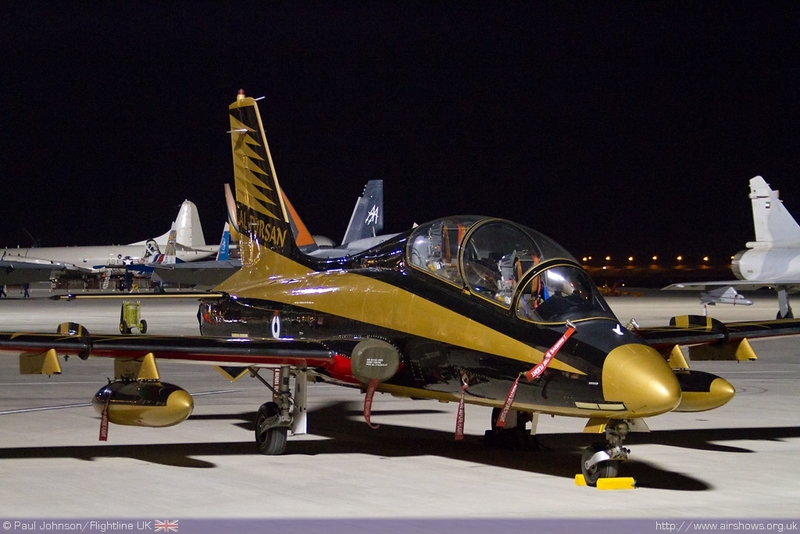 Jordan has had its own national display team for many years in the guise of the Royal Jordanian Falcons which has displayed with the Pitts Special before moving on to the Extra 300L. 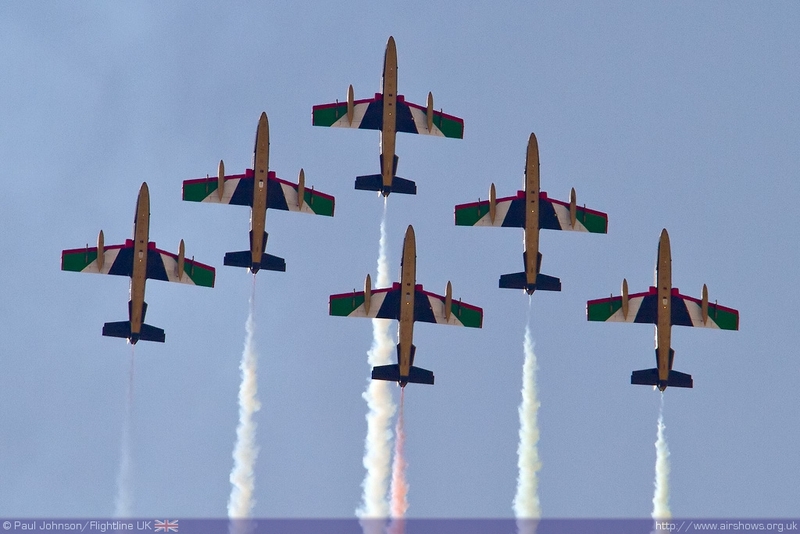 That team has been a popular addition to airshows throughout the world providing Jordan with a superb means of promoting the country on the international airshow circuit, particularly during the European airshow season. 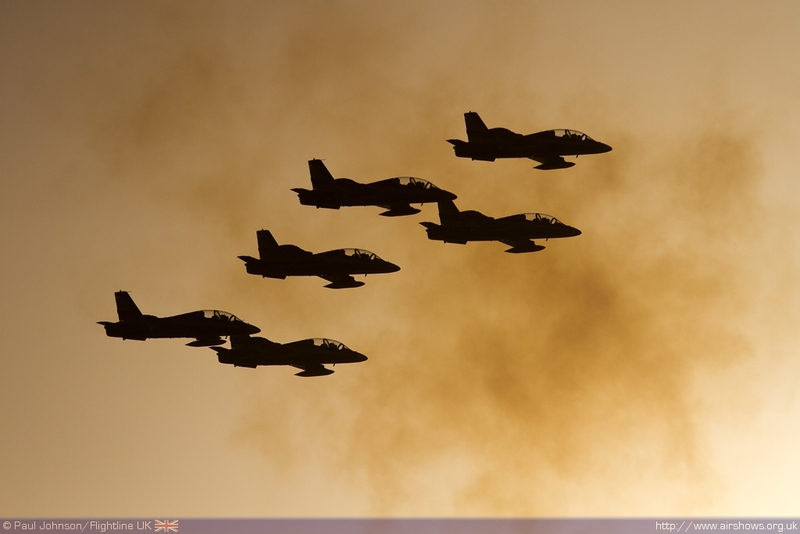 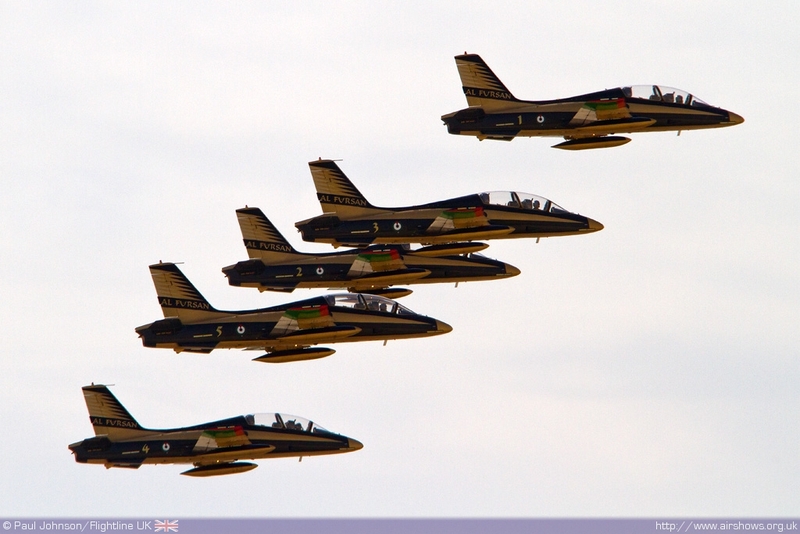 The first major jet based team to form were the Saudi Hawks flying the BAE Systems Hawk T Mk. 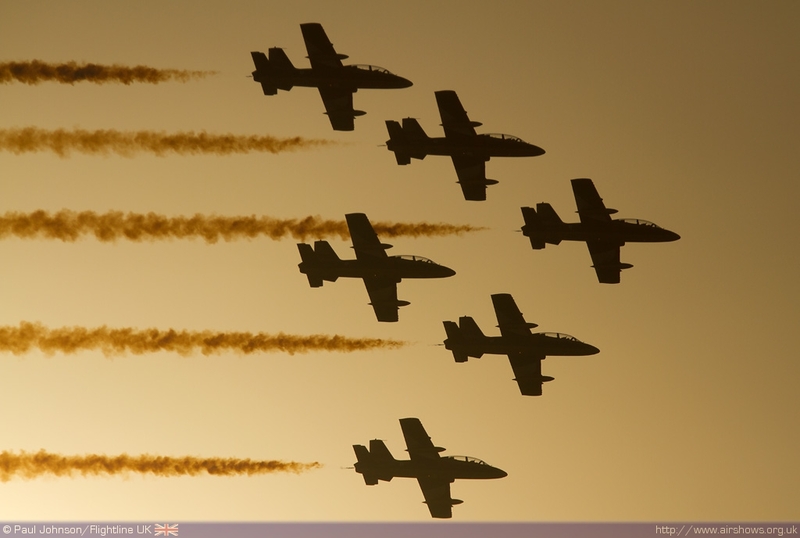 65/65A. 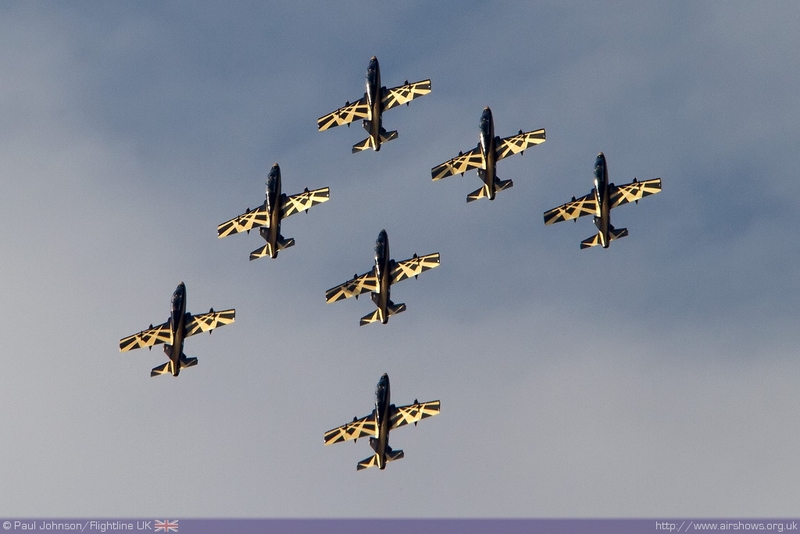 A great deal of help came from the Royal Air Force and BAE Systems themselves in term of training. 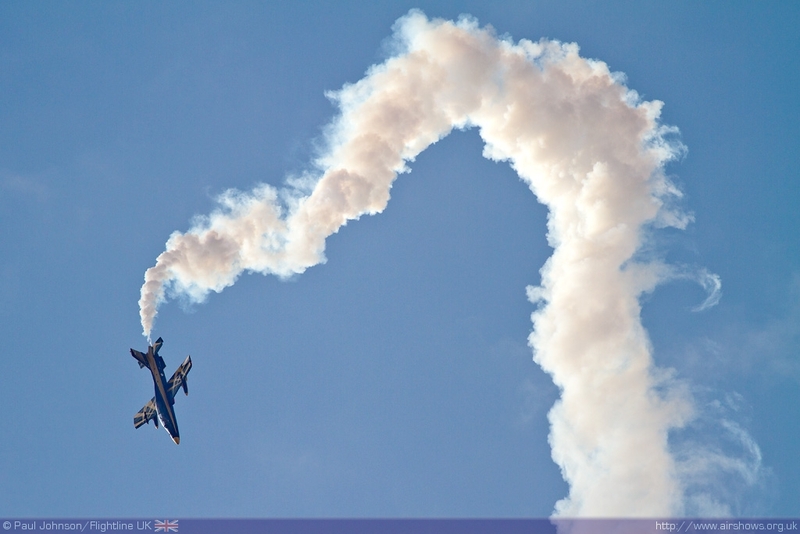 Former Red Arrows pilots have been posted to the team on exchange in a valuable advisory role as well as providing English speaking commentary at international events. 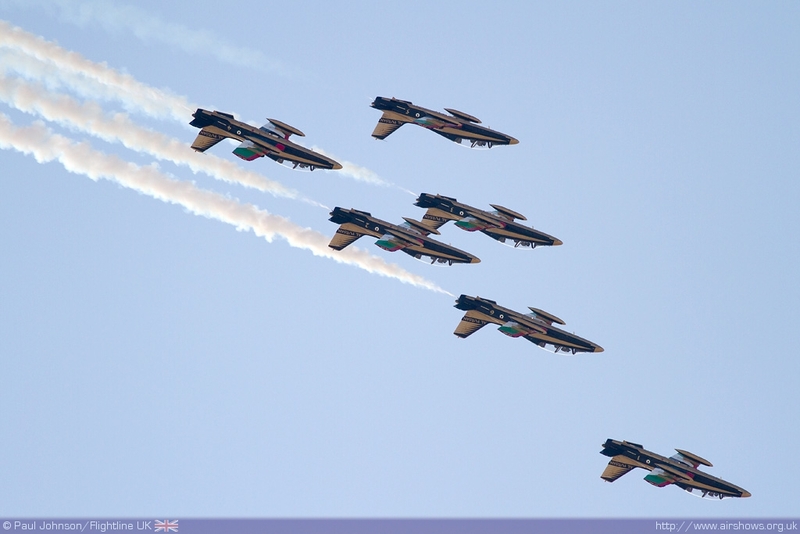 The Saudi Hawks have been popular performers in the Middle East, particularly a national events as well as performing at International Air Shows at Al Ain in the UAE and the Bahrain International Airshow. 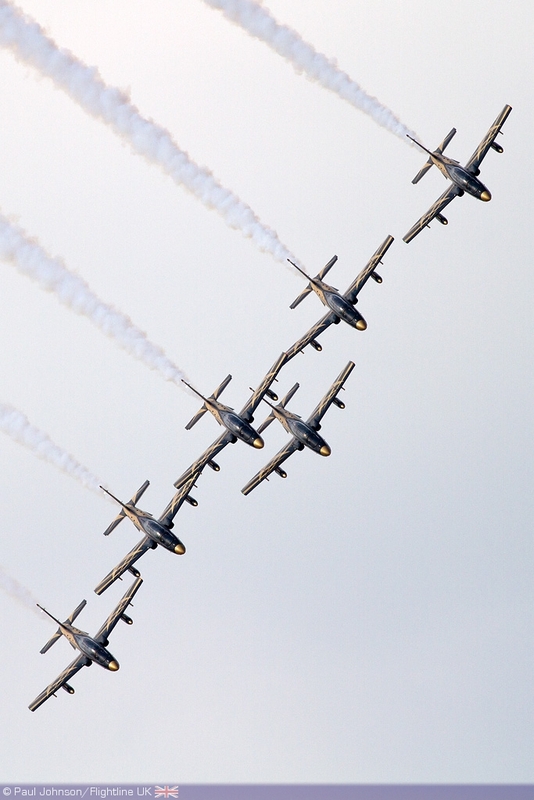 It was not until 2011 the team finally made appearances in Europe with performances at Zeltweg, Koksijde and the Royal International Air Tattoo. 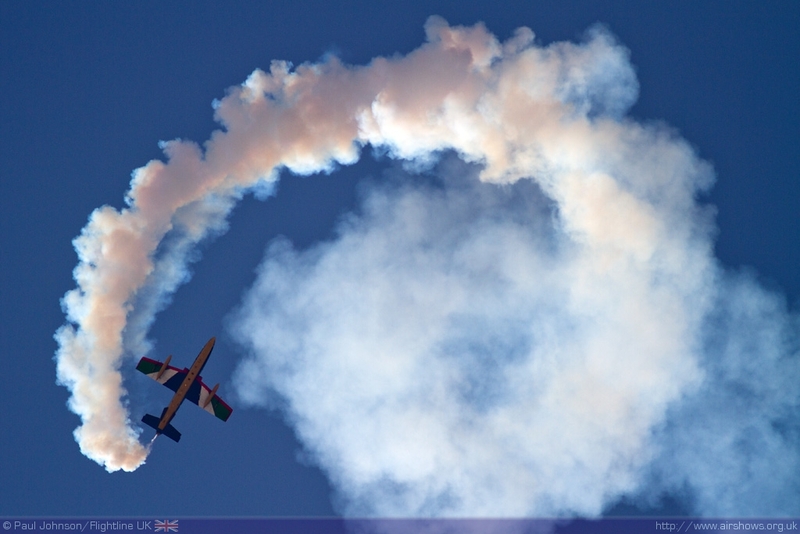 It is hoped the team will be returning for another short European tour in June and July. 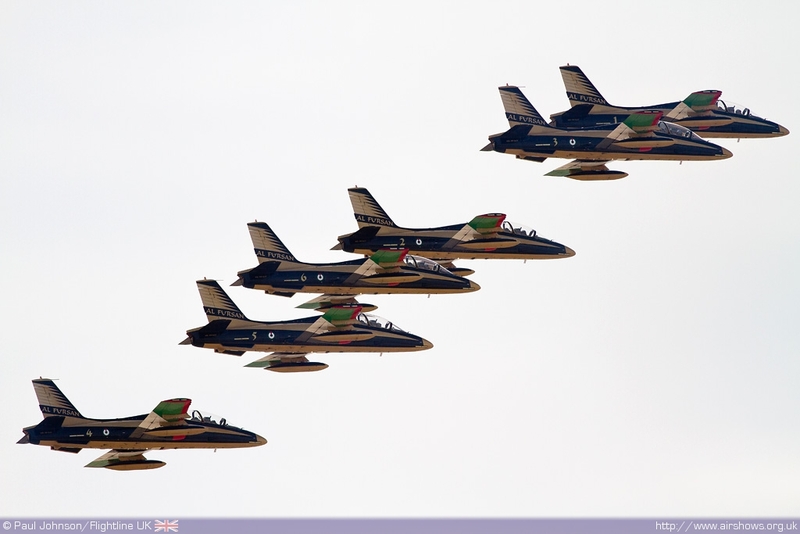 The success of the Saudi Hawks has clearly provided impetus to the United Arab Emirates which announced the formation of Al Fursan (The Knights) at the 2010 Al Ain Aerobatics Show. 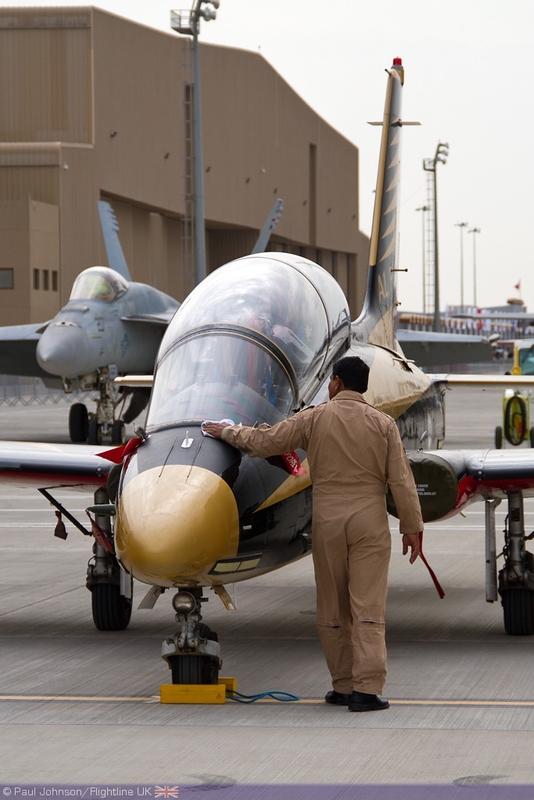 Lt Colonel Abdulla al Amimi announced “The objective is to raise the UAE flag and show the proficiency of the Air Force and armed forces.” The name was chosen to reflect the nobleness, professionalism and sacrifice of the UAE’s pilots. 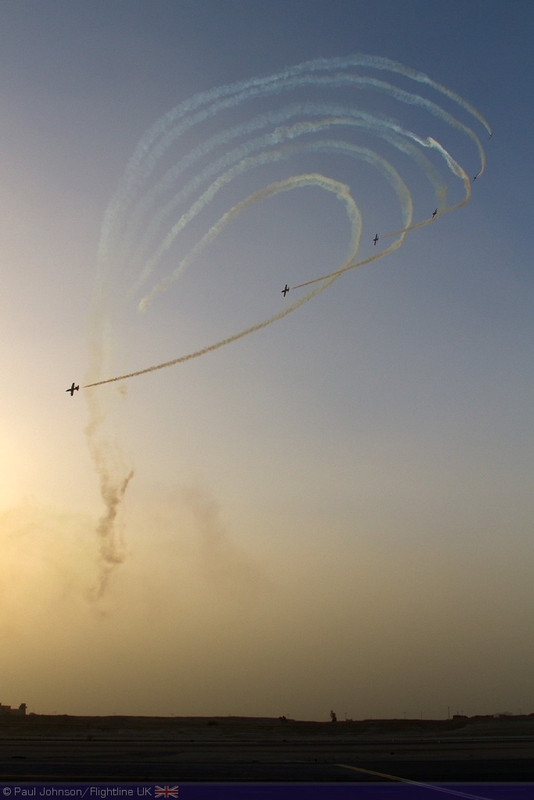 Al Ain is home to the Khalifa Bin Zayed Air College which provides training to future UAEAF pilots on the Pilatus PC-7 and the Hawk T. Mk 63. 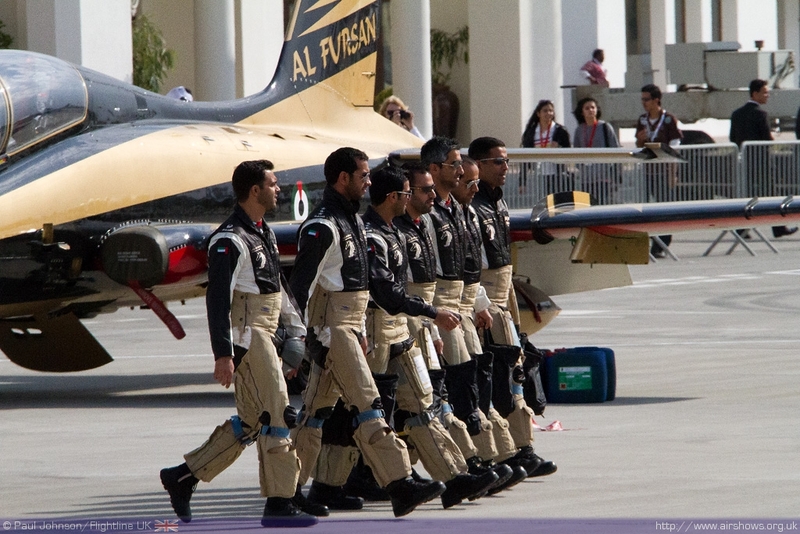 Unlike the Saudis, the UAE chose not field a team of Hawks, instead opting to use their entire fleet of six Alenia Aermacchi MB339A trainers from the College. 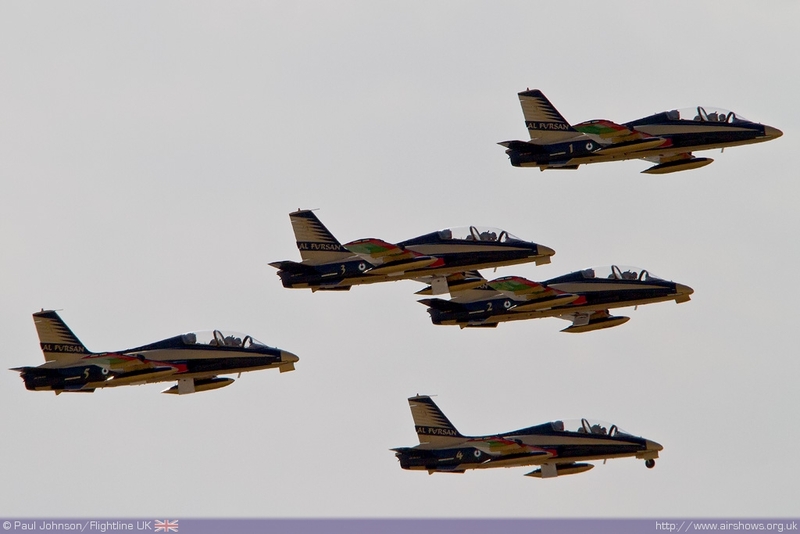 Following the announcement, the six MB339A aircraft were sent to Aermacchi’s Venegono factory to be converted to MB339NAT(National Aerobatic Team) standard. 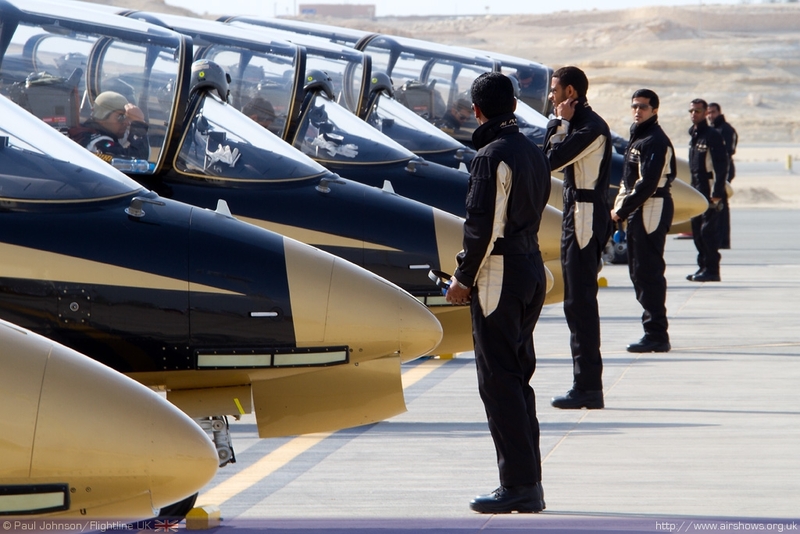 Four further second hand MB339A airframes were also procured for the team and similarly modified top bring the total fleet size to 10 aircraft. 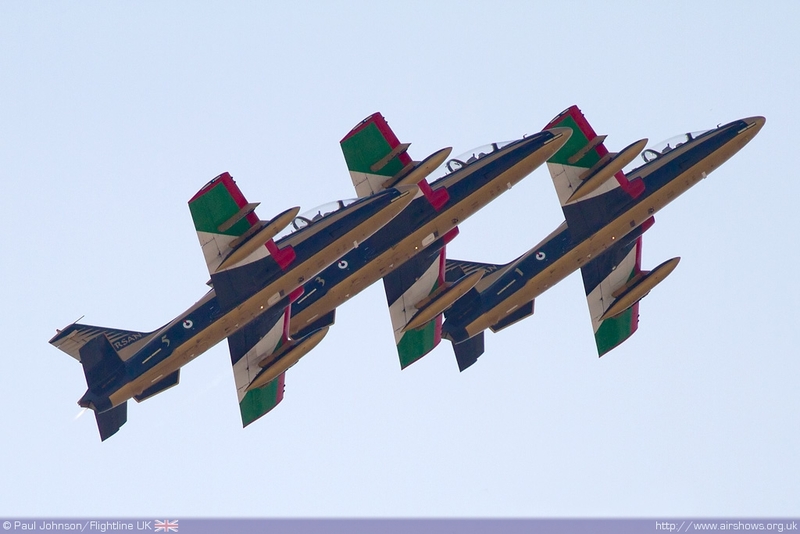 The modifications are very similar to those for the Italian Air Force’s team, Il Frecce Tricolori, and involve the removal of the wingtip fuel tanks, modified fuel systems and the installation of the smoke generation system. 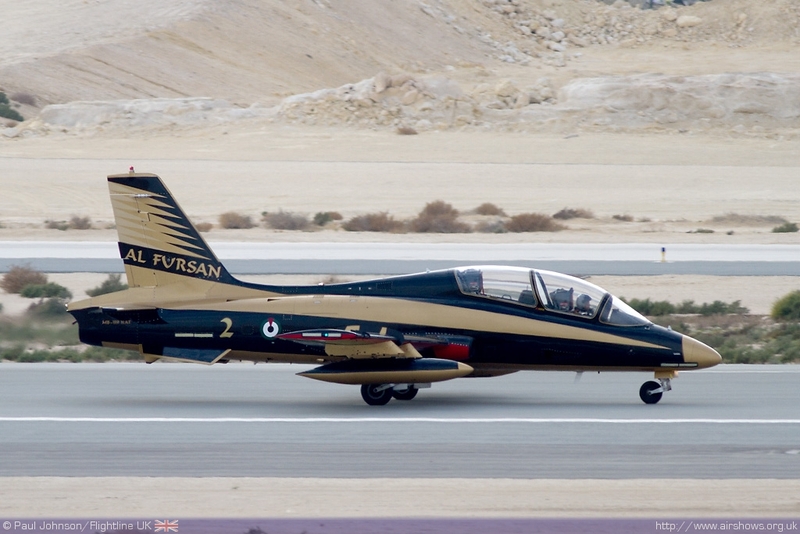 The aircraft were also adorned in a spectacular paint scheme of Black and Gold, with the underside carrying the national colours of the United Arab Emirates. 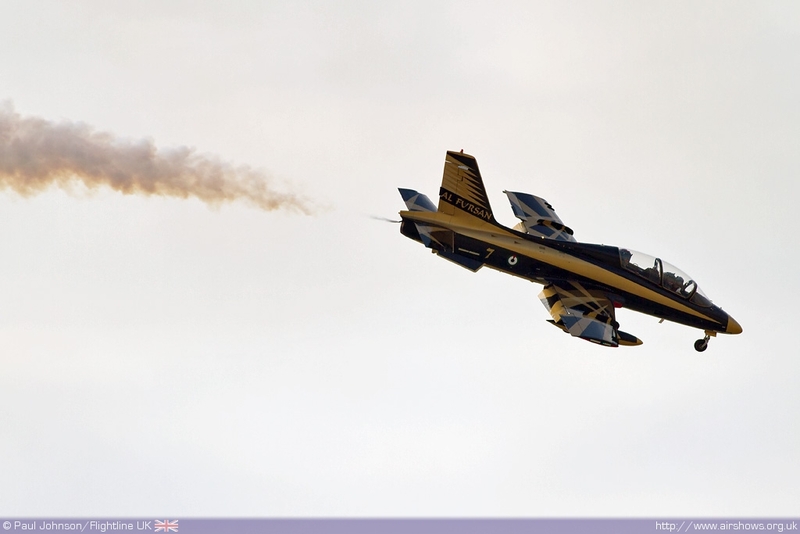 The Black and Gold scheme represents the golden sandy deserts of the UAE with the rich oil reserves beneath it. 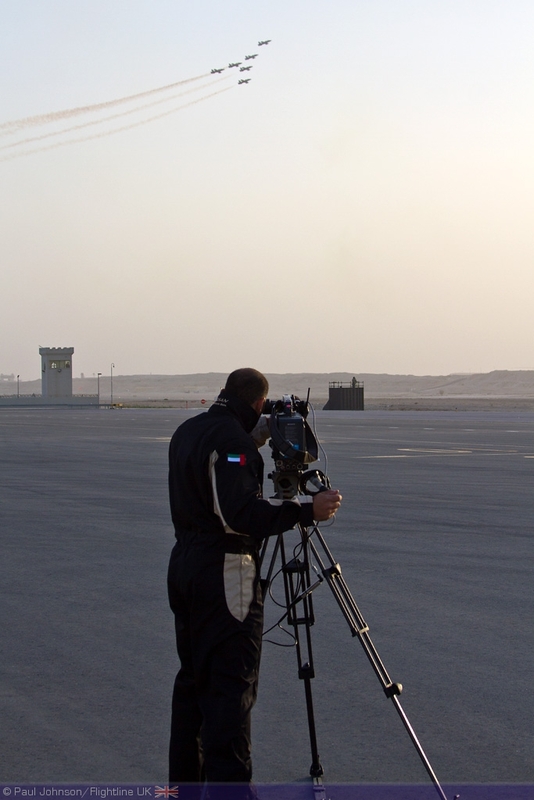 The Italian connections run much deeper than just the aircraft as the pilots of Al Fursan received training from their illustrious Italian counterparts at Rivolto. 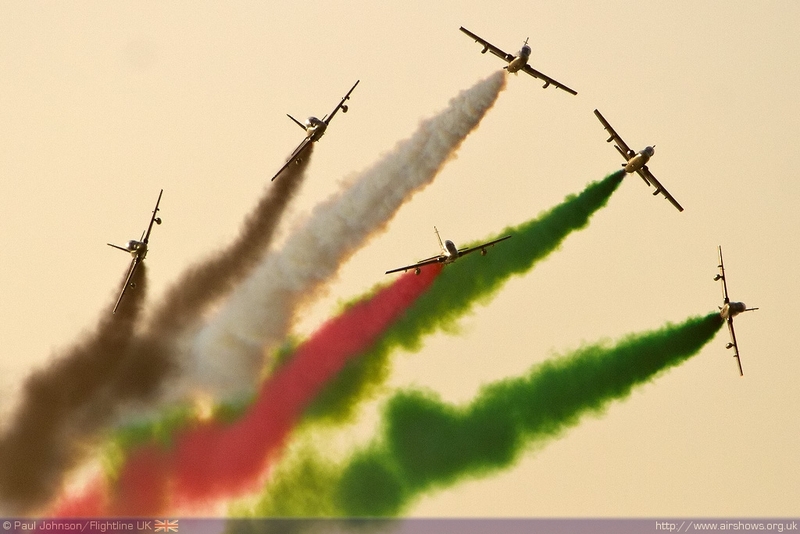 Like the Saudi Hawks, there are Italian coaching staff on the ground during the team’s training and public performances. 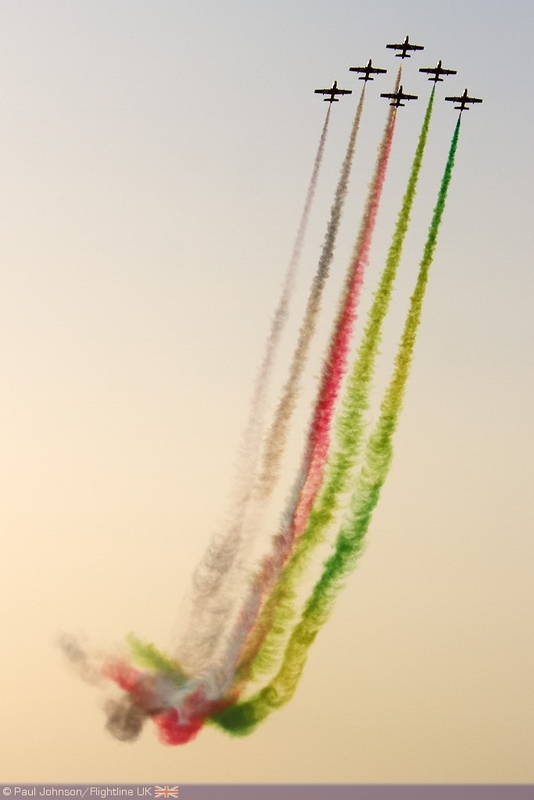 Under the leadership of Lieutenant Colonel Nasser Ahmad Al Obaidli, the team finally made their public debut at Dubai Airshow 2011 following 16 months of initial training. 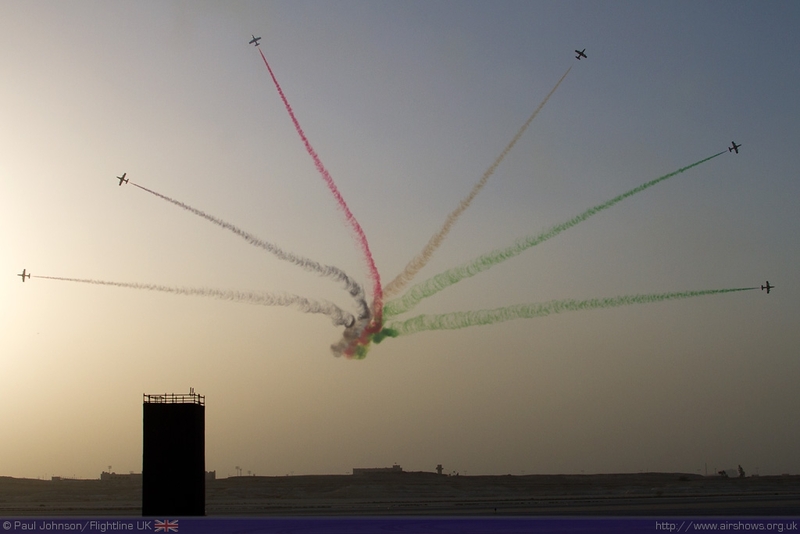 They were also very involved in the celebrations of the UAE’s national day later in November 2011. 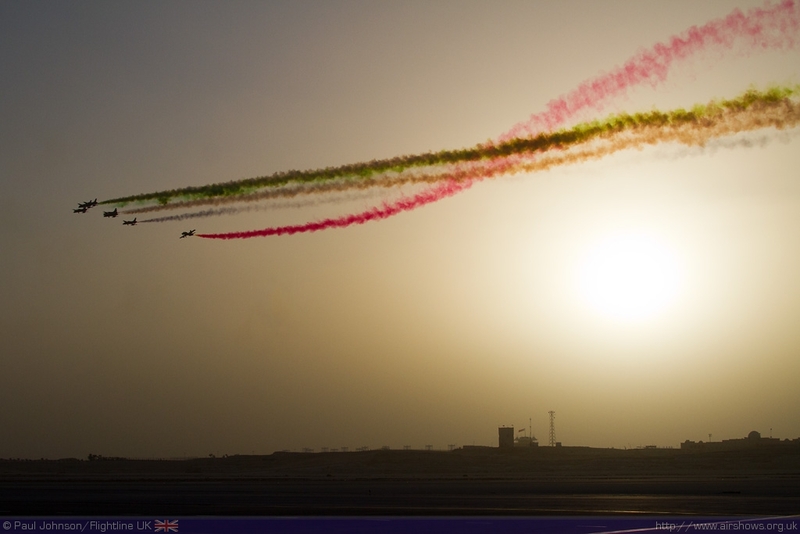 As well as presenting their own routine at Dubai, the team also made some memorable flypasts with the visiting Patrouille De France team, but also with an Emirates Boeing 777-300ER aircraft to close the show. 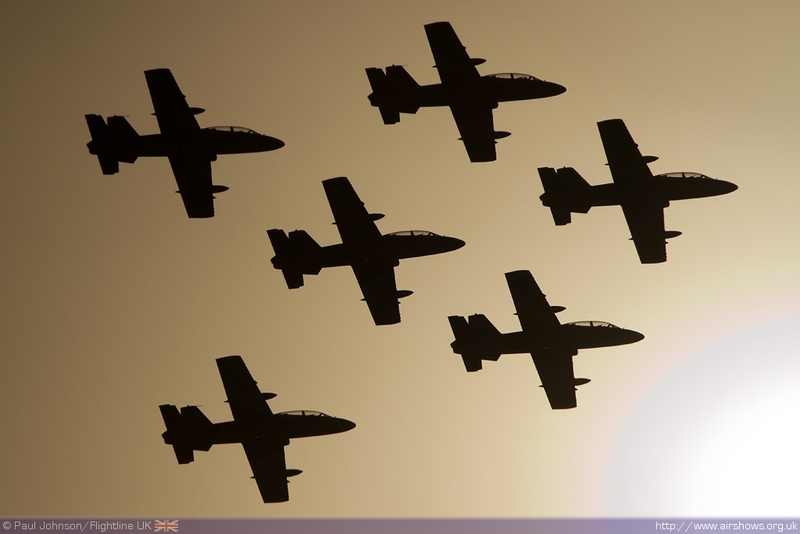 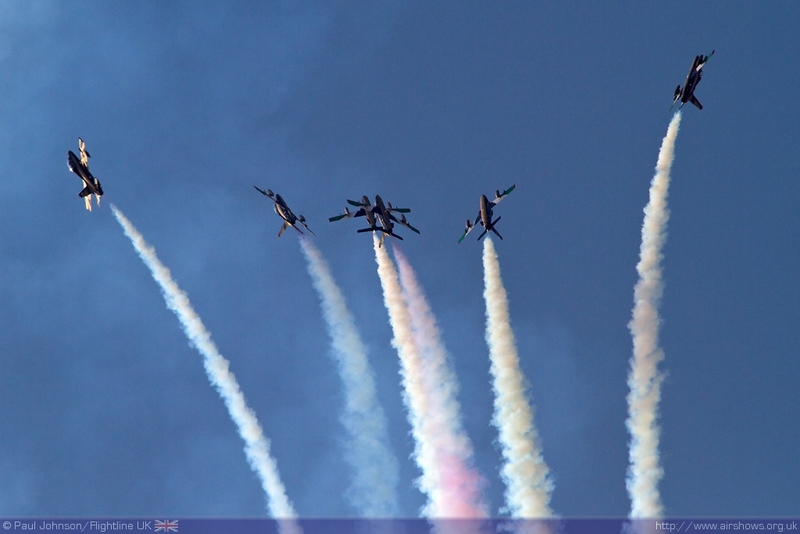 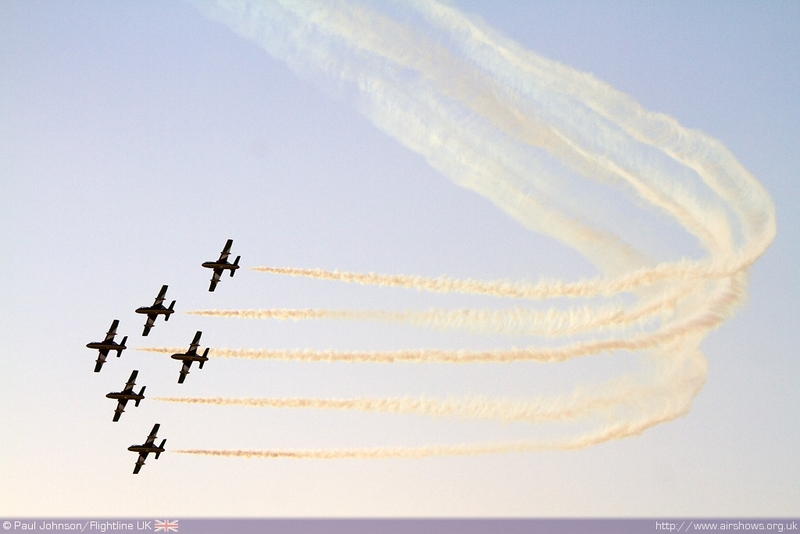 he Team made their international debut at the Bahrain International Airshow in January 2012. 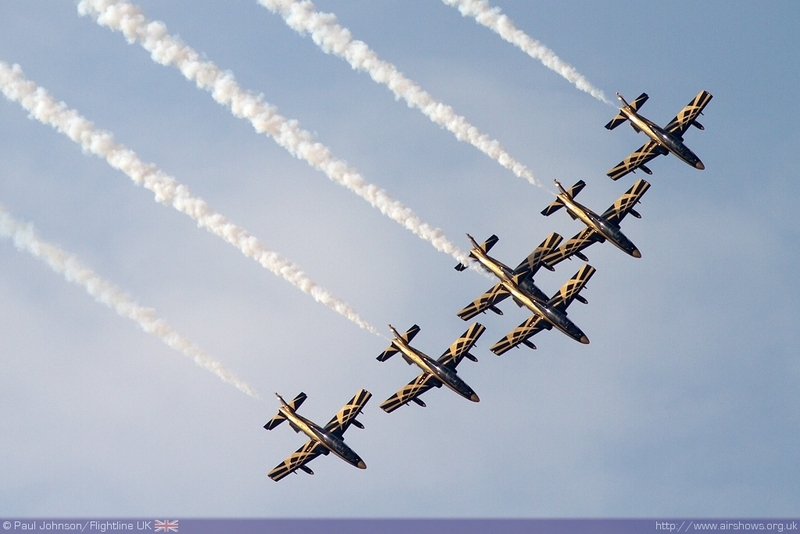 The team perform as a seven ship and were very impressive for such a new team. Their display certainly is very polished and precise and clearly draws on their experience training with Il Frecce Tricolori. 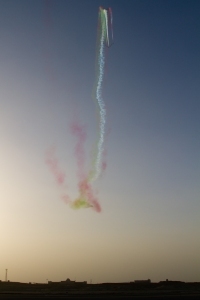 In particular the solo performer with Al Fursan flies all the favourite ‘party-pieces’ of the Frecce’s solo including the tailslide, lomcevak and the ‘crazy flying’ pass. 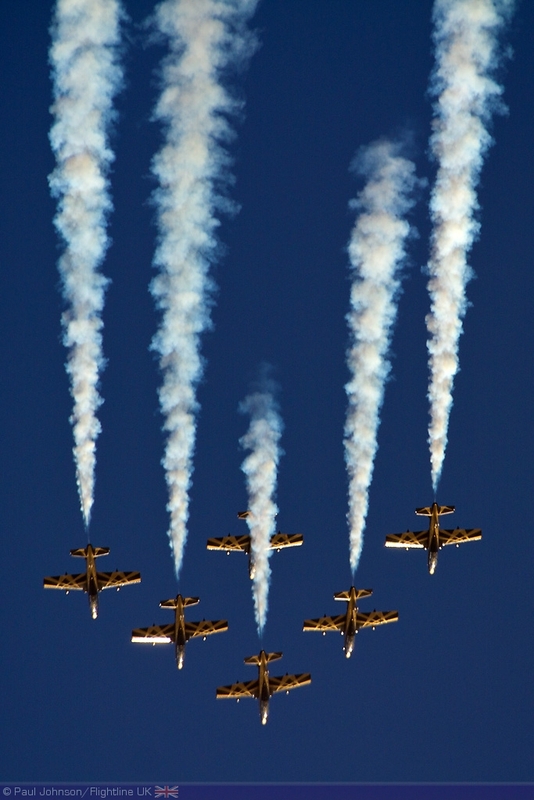 The formation part of the routine however is very original and pleasing with some big formation aerobatics making full use of the coloured smoke as well as some interesting synchronised figures and breaks. 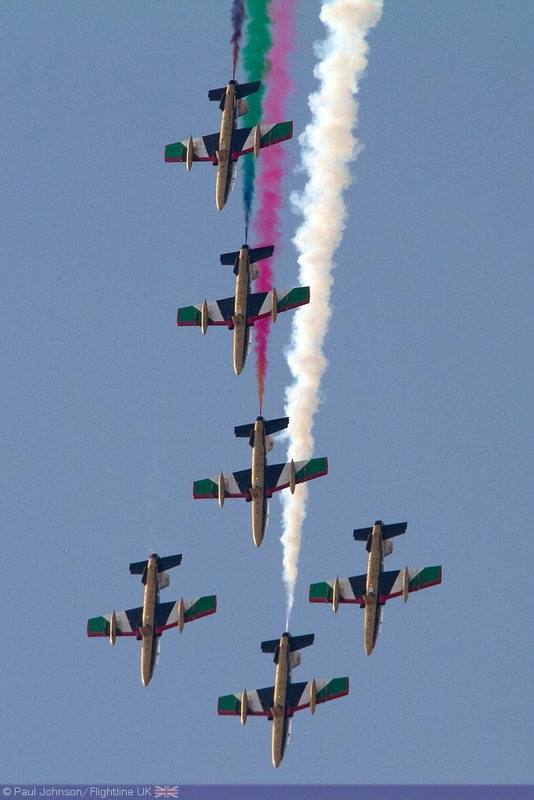 Along with the Russian Knights, the appearance of Al Fursan in Bahrain was one of the outstanding highlights of the show. 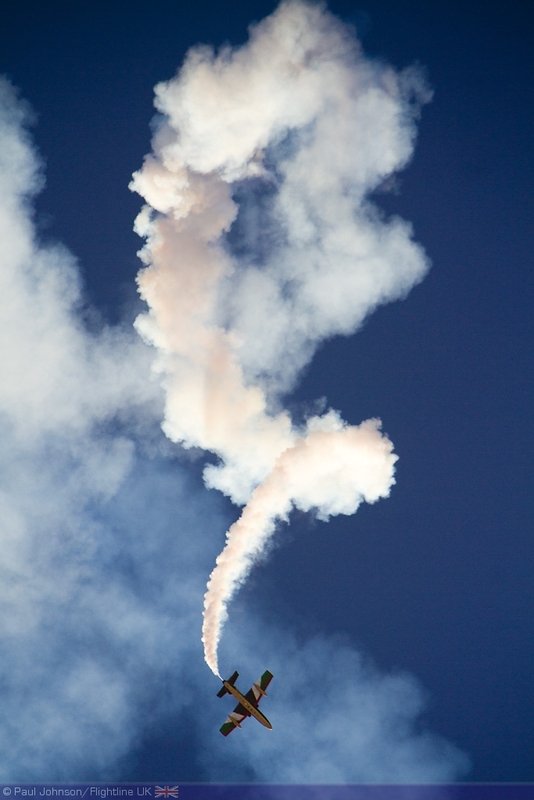 They certainly surprised plenty of observers with their well-choreographed display routine, particularly in the rough windy conditions that all the teams had to endure on the final day of the show. 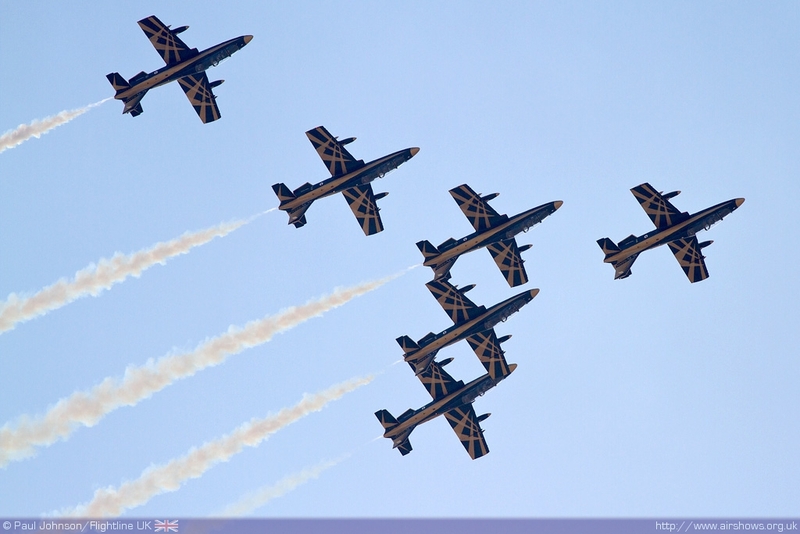 TJuly will see the team make their European debut at the Royal International Air Tattoo, RAF Fairford. 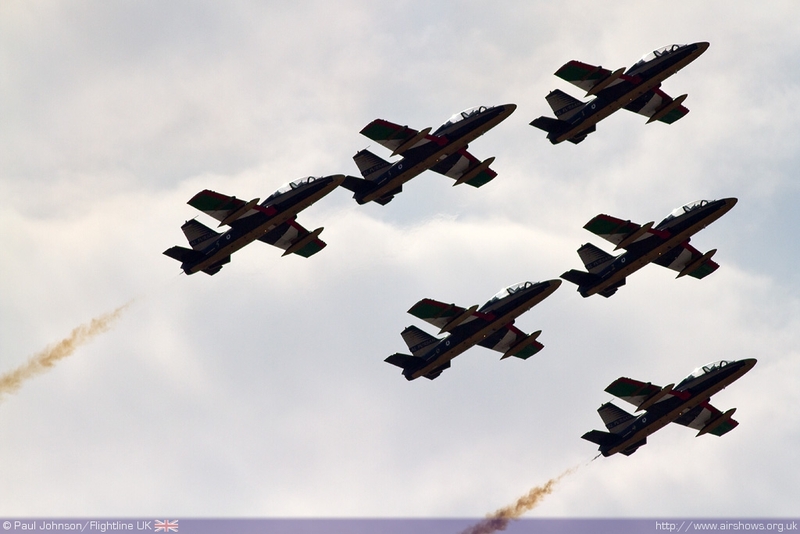 Whilst it is clearly a major coup for the Air Tattoo, the team’s attendace clearly means a lot to the team themselves. 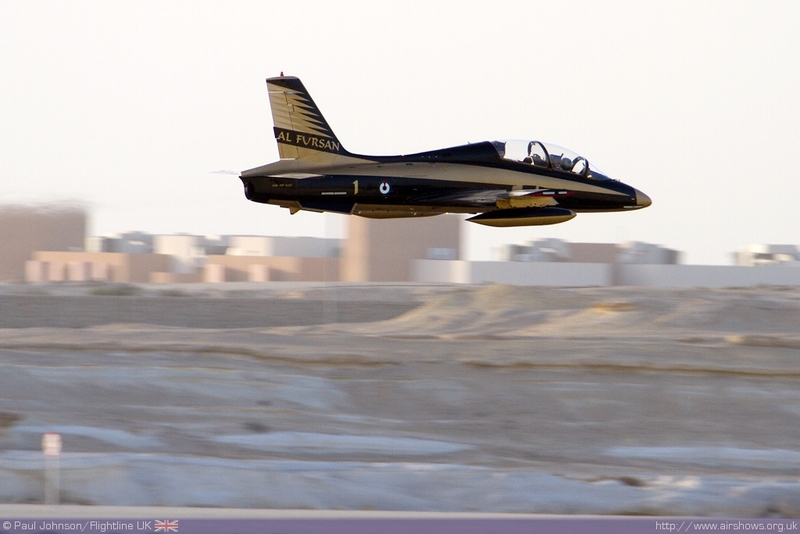 The presence of Al Fursan at the Royal International Air Tattoo is certainly something to look forward to and we hope they’ll also be return visitors in the years ahead at military shows across Europe long with other representatives of Middle Eastern nations. 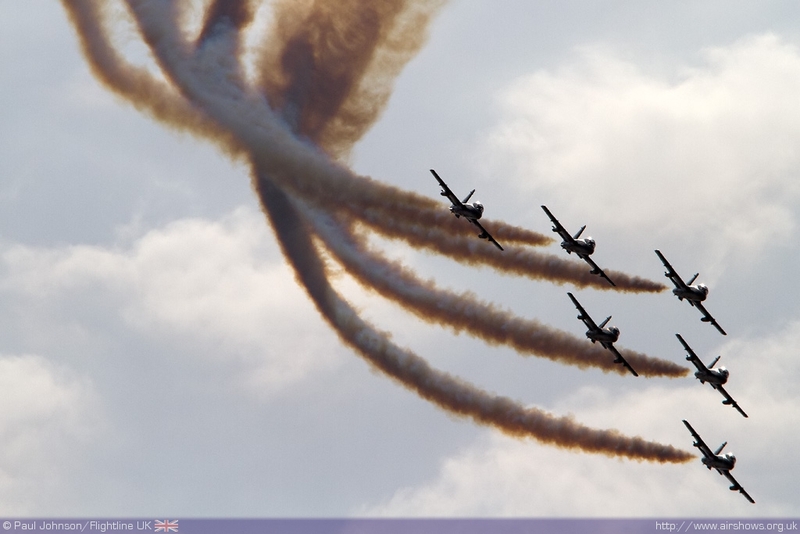 They certainly add a lot of colour and character to the airshows they attend.